2. Why I don't see the passcode screen? The typically example is exiting program by pressing "HOME" button or interruption by phone call. In technical point of view, this situation is the same of "minimizing" windows in you PC. Like the Windows in PC, Android interprets this as an intent to hide the session temporarily and keep the Orange Diary alive in background. Then, when user start the program again, Android brings the screen back to front and show where he left. That's the reason most of users feel the passcode is not working when they bring back Orange Diary. This is a typically behavior of mobile based operating system. Following is a standard procedure to test the security lock and this will help you understand the security lock concept in Orange Diary. Step 1) Go to "Orange Diary main screen > MENU > settings > Security lock". 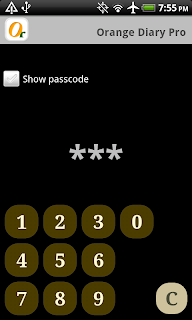 Step 2) Mark the Check box, "Enable security lock"
Step 3) Go to "Passcode" screen by pressing "Set passcode". Step 5) Now, exit Orange diary using "BACK' button on your phone. This is IMPORTANT! Leaving Orange Diary using "HOME" button doesn't completely close the program and temporarily hide the Orange Diary behind other screens. Please use "BACK" buttons and close the screens one-by-one until you see the android Home screen. Step 6) Do something else and then, restart Orange diary from program list. Step 7) Enter "123" and go to main screen.